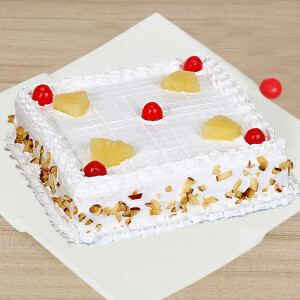 We do not support landscape mode yet. 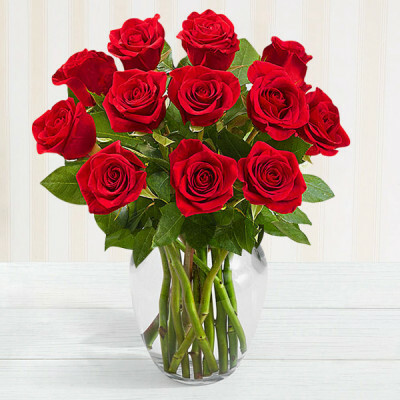 Please go back to portrait mode for the best experience. Commemorate the victory of good over evil with your loved ones, by sending them one of these amazing Dussehra hampers online from MyFlowerApp. 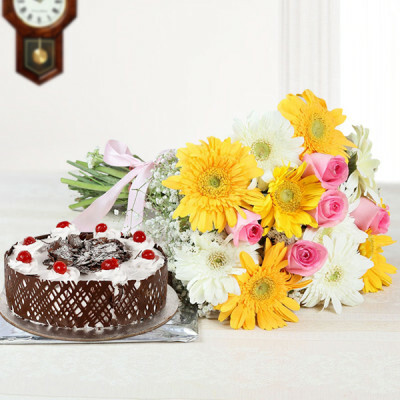 Celebrate the occasion with your friends and family, even if you are living far away. 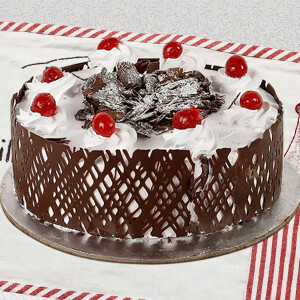 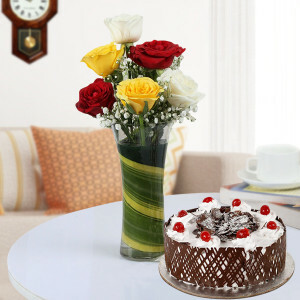 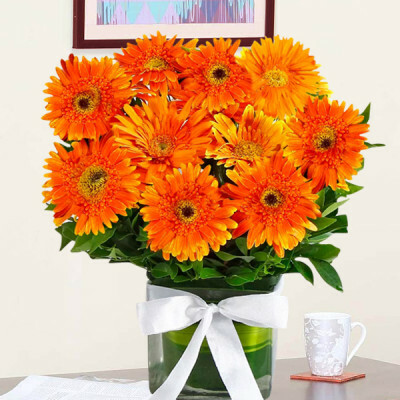 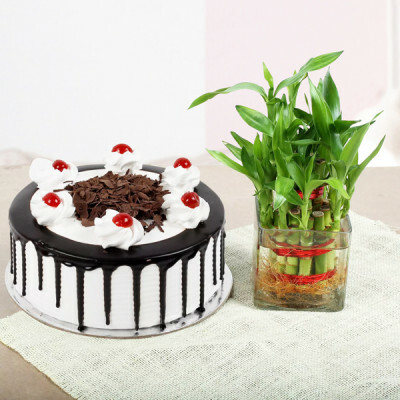 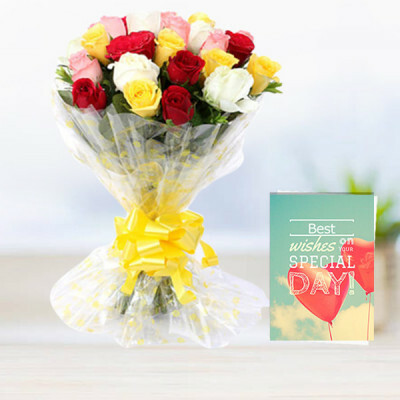 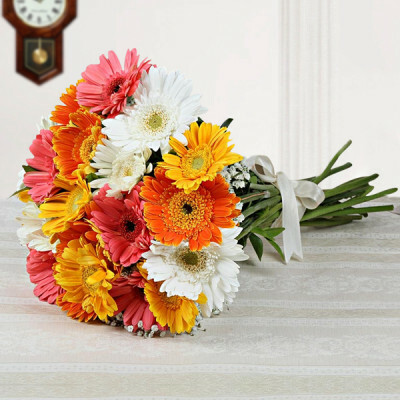 Choose from our expansive range of flowers, cakes, chocolates, personalized gifts, and combos, and have them delivered anywhere in India, free shipping. 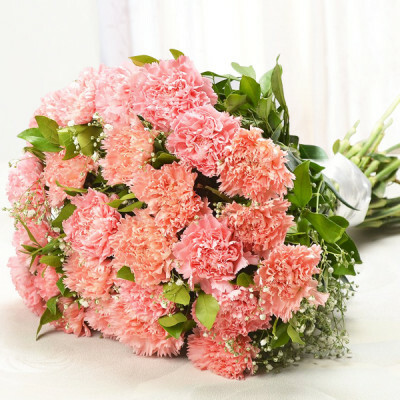 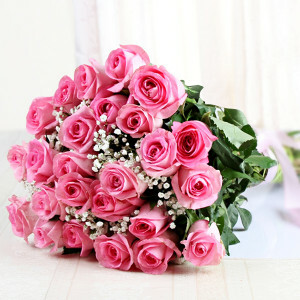 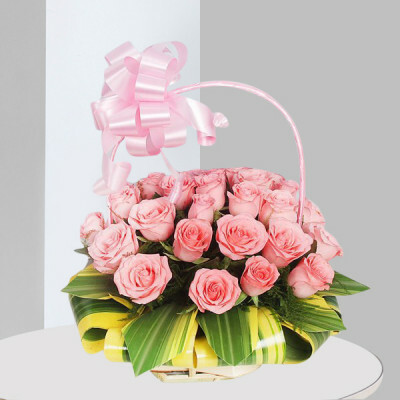 - Basket arrangement of 25 pink roses. - 10 Pink Carnations, 5 Pink Roses and 2 White Asiatic Lilies in Pink Packing Paper. 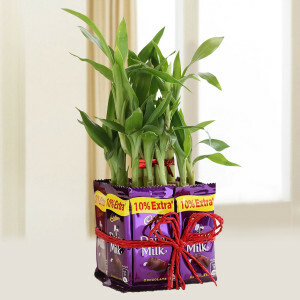 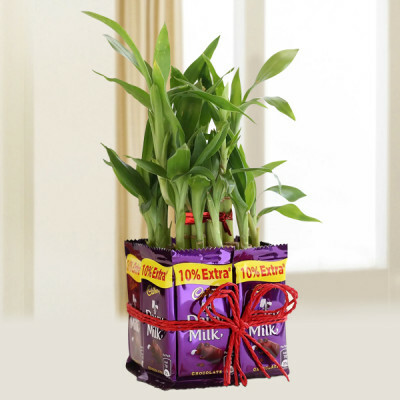 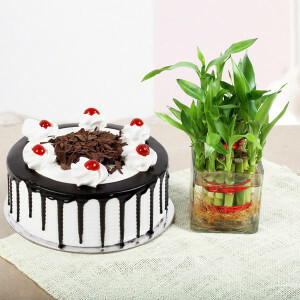 - Two-Layer Lucky Bamboo Plant with Square Glass Vase- 3 x 3 inches and 8 Dairy Milk Chocolates- 12.5 gms each. 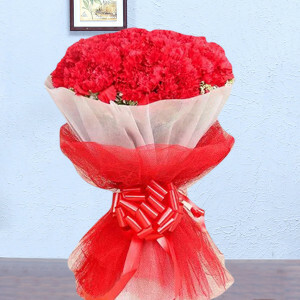 - Bouquet of Ferrero Rocher Chocolate 3 pcs, 8 Red Roses and White & Red Teddy Bear with Yellow Paper Packaging. 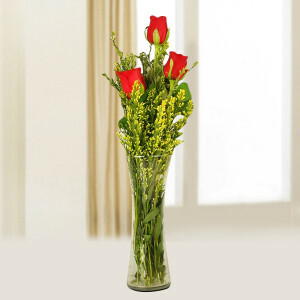 - 3 Red Roses in a glass vase. 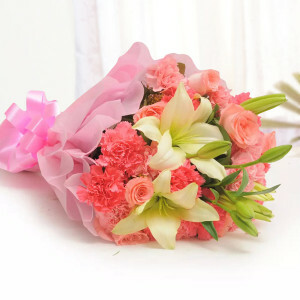 - 3 Pink and 2 White Oriental lily in a glass vase. 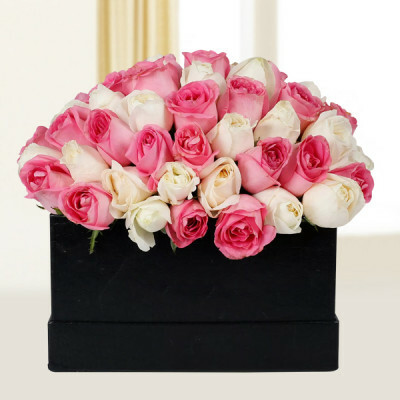 - 40 Pink Roses in a Rectangle Black Colour Card Board Box Dimensions (L x H x W)- 9.5 x 5 x 6.5 Inches Approx. 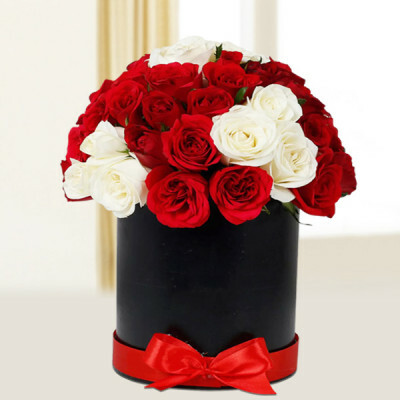 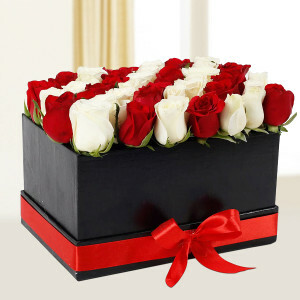 - 25 Red Roses and 15 White Roses in a Round Shape Black Colour Card Board Box Dimensions (H x W)- 9 x 6 Inches Approx. - 22 Red Roses and 22 White Roses in a Rectangle Black Colour Card Board Box Dimensions (L x H x W)- 9.5 x 5 x 6.5 Inches Approx. 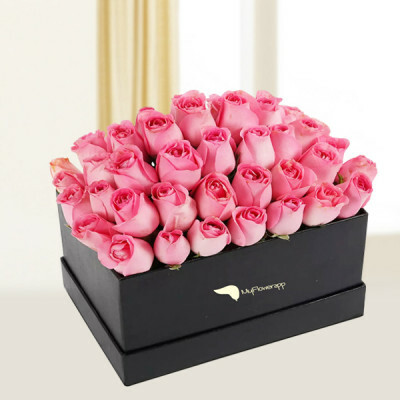 - 30 Pink Roses and 30 White Roses in a Rectangle Black Colour Card Board Box Dimensions (L x H x W)- 9.5 x 5 x 6.5 Inches Approx. 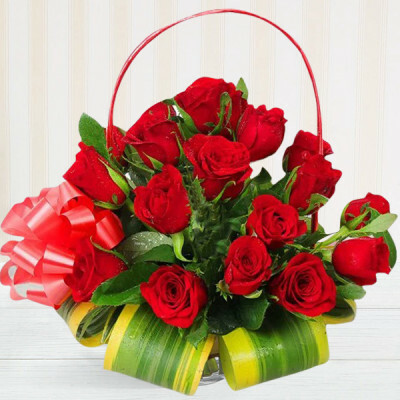 - Basket of 40 Red Roses. 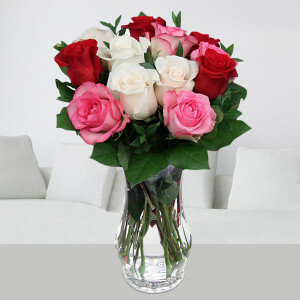 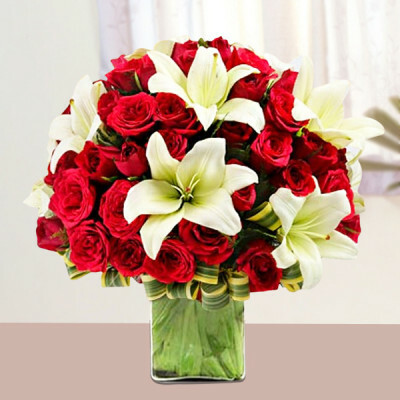 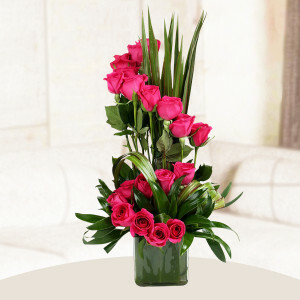 - 12 long stemmed red, pink and white roses expertly arranged in a clear glass vase. 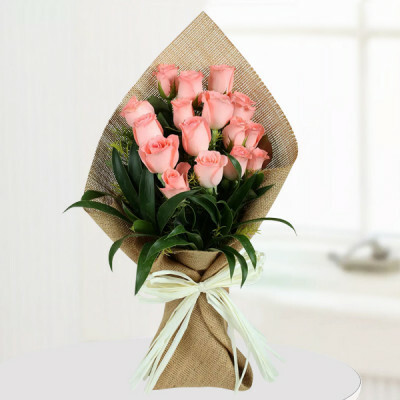 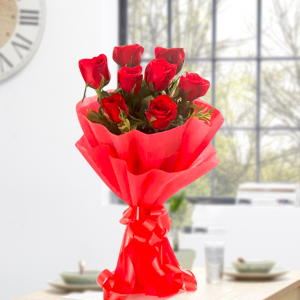 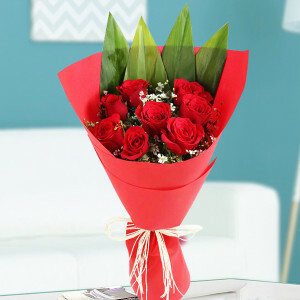 Mix roses symbolize everlasting love and liking and thus, a wonderful gift for those special people in your life. 12 Mix roses are taken together and attached with a ribbon bow. 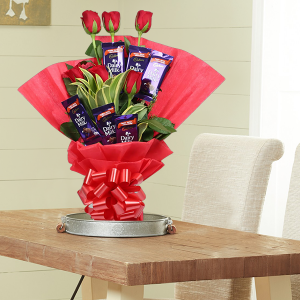 While the flawlessly arranged flowers reveal love and Dairy milk chocolate is confident to please one’s sweet tooth. 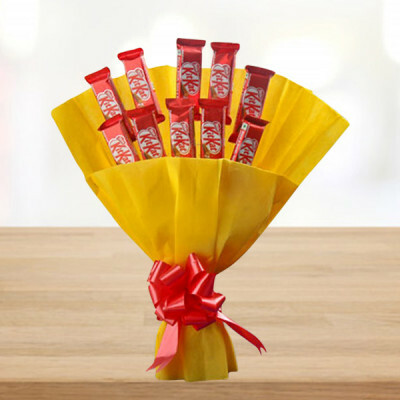 10 Kit Kat Chocolate in a tissue paper very nicely wrapped with Matching bow tie on it. 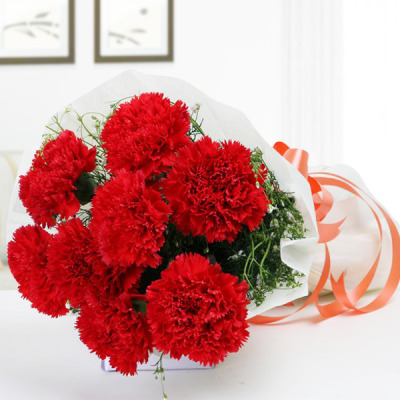 - 6 Red carnations bunch. 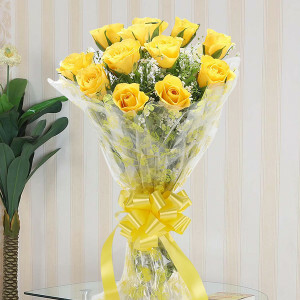 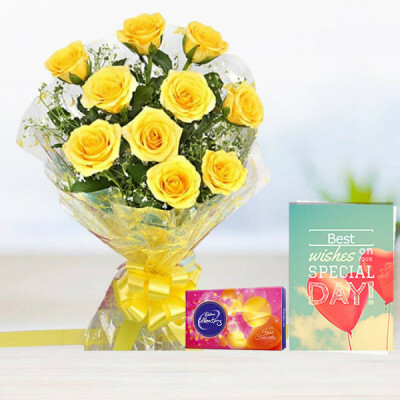 6 yellow roses in a cellophane packing with a yellow ribbon bow, Cadbury Celebration pack 119gm & a greeting card. 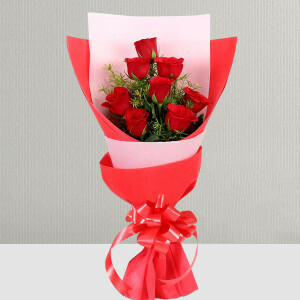 - 6 Red roses and 6 dairy milk chocolate of 12.5gm in red paper packing. 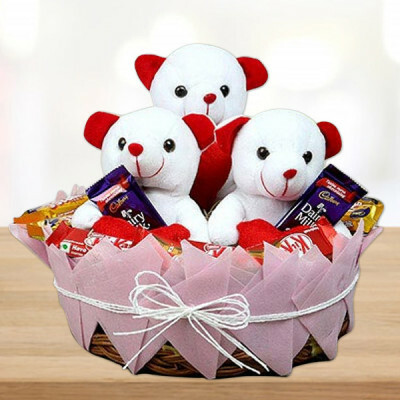 It includes a pair of red and white colored teddy bear and 10 pieces of Cadbury dairy milk chocolates. 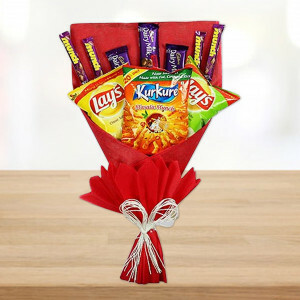 This bouquet includes Cadbury perk, dairy milk, and five-star Chocolates, nestle KitKat chocolates, good day butter cookies, Britannia bourbon, classic salted peanuts, and haldiram's aloo bhujia and masala moong daal. 5pc Ferrero Rocher and teddy in a glass vase. 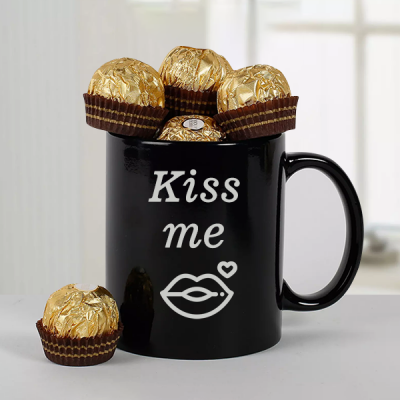 - Ferrero Rocher Chocolate 5 pcs. 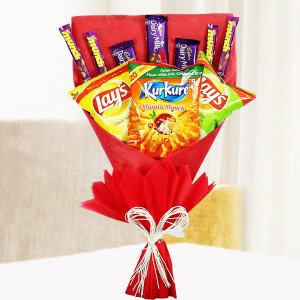 It includes Lay's potato chips, kurkure, and nestle munch and Cadbury fruit & nut chocolates in it. - 8 Ferrero Rocher in a printed black ceramic mug. 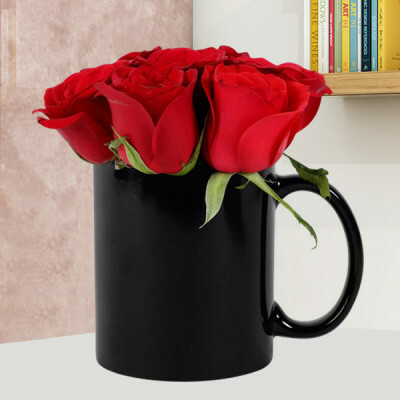 Stay up-to-date on everything we're up to. 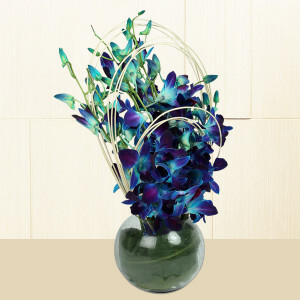 Sign up for our news blast and get up to speed on all of our newest releases and product updates. Copyright © 2019, MyFlowerapp.com, All Rights Reserved.